HEADQUARTERS: P.O. Box 981300 • West Sacramento • CA 95798 (Mailing Address) 1550 Harbor Blvd., Suite 211 • West Sacramento • CA 95691 • (916) 791-5044 EXECUTIVE DIRECTOR: Russell W. Snyder, CAE, rsnyder@calapa.net TECHNICAL DIRECTOR: Brandon Milar, P.E., bmilar@calapa.net MEMBER SERVICES MANAGER: Sophie You, syou@calapa.net ADMINISTRATIVE ASSISTANT: Ritha Nhorn, rnhorn@calapa.net GUEST PUBLISHER: Russell W. Snyder, CalAPA PUBLISHED BY: Construction Marketing Services, LLC • P.O. Box 892977 • Temecula • CA 92589 (909) 772-3121 • Fax (951) 225-9659 GRAPHIC DESIGN: Yesenia Ramirez CONTRIBUTING WRITERS: Russell W. Snyder, CalAPA; Brandon Milar, P.E., Brian Hoover, CMS ADVERTISING SALES: Kerry Hoover, CMS, (909) 772-3121 • Fax (951) 225-9659 Copyright © 2017 – All Rights Reserved. No portion of this publication may be reused in any form without prior permission of the California Asphalt Pavement Association. California Asphalt is the official publication of the California Asphalt Pavement Association. 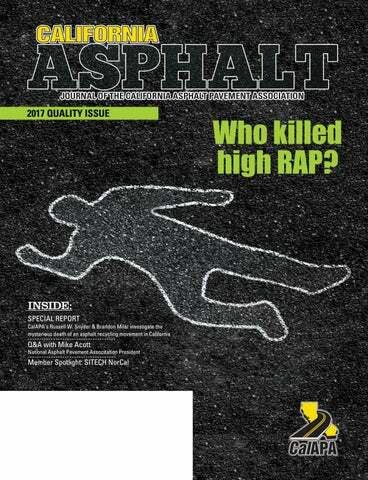 This bimonthly magazine distributes to members of the California Asphalt Pavem­­ent Association; contractors; construction material producers; Federal, State and Local Government Officials; and others interested in ensuring that asphalt remains the high quality, high performance pavement choice in the state of California. The American Association of State Highway & Transportation Officials (AASHTO) and the Federal Highway Administration (FHWA) publish a report, Synthesis of Highway Practice No. 54, Recycling Materials for Highways, which provides information on how Reclaimed Asphalt Pavement (RAP) is used in pavements. The National Cooperative Highway Research Program (NCHRP) releases a report, NCHRP REP 452 Recommended Use of Reclaimed Asphalt Pavement in the Superpave Mix Design Method: Technician's Manual is published providing guidance on the use of RAP. The California Department of Transportation (Caltrans) begins to permit 15 percent RAP allowed in densegraded mixes on Quality Control/Quality Assurance (QC/QA) projects per a “nonStandard Special Provision (nSSP). 2007 Caltrans permits 15 percent RAP allowed in all dense-graded mixes per SSP. generally oxidized and stiffer from spending years on the roadway, would interact with virgin binder. In 1978, the National Cooperative Highway Research Program (NCHRP) published “Synthesis of Highway Practice No. 54, Recycling Materials for Highways,” which provided a state of the practice for the use of RAP in asphalt mixes. Since the publishing of the synthesis, the NCHRP, Caltrans, and other State DOTs conducted research related to RAP. An important outcome of the subsequent research was the development of a process to assess the properties of the combined binders. This process compares the virgin binder characteristics with the RAP binder characteristics. According to the procedures in Section 11.4 of the 7th edition of the Asphalt Institute’s MS-2, Asphalt Mix Design Methods, producing the blending charts requires plotting the Direct Shear Rheometer (DSR) and Bending Beam Rheometer (BBR) specified limits based on the project-specified PG binder and true grades of both the virgin and recovered RAP binders. In order to test the RAP binders, RAP binders are extracted and recovered with the use of a process using hazardous chemicals. Caltrans, as well as many contractor labs, no longer allow the use of these chemicals in their labs due to worker health and safety concerns. Even with this concern, Caltrans continues to require contractors to utilize these chemicals to extract and recover RAP binders for both mix design and quality control. For those contractors that do not allow the use of these chemicals, the extraction and recovery process are completed by third-party labs that are better equipped to handle the hazardous chemicals. Nov. 12, 2009 Tom Carter, Teichert Aggregates, delivers a presentation on RAP best practices at the CalAPA Fall Asphalt Pavement Conference in Sacramento. and recovery procedure and testing the recovered sample per AASHTO M320. Blending charts or equations are used along with the true grade of the virgin binder to determine the properties of the blended RAP and virgin binder. This blended true grade at both high and low temperature should meet the requirements of the project binder grade which is typically based on factors such as traffic and climate. AI also recommends the use of cracking performance tests to assess the cracking susceptibility of high RAP mixes.” Overseas, meanwhile, some countries have raced ahead to embrace high RAP. For example, a 2015 report from the National Asphalt Pavement Association (NAPA) noted that in Japan, on average, 47 percent RAP is used in asphalt pavements. On Feb. 7, 2002, the Federal Highway Administration (FHWA) codified the concept of using recycled materials when it issued a formal policy on the use of recycled materials. “By providing leadership and technical guidance to the transportation community, FHWA will stimulate advancements in recycling technology and the discovery of new opportunities for the appropriate use of recycled materials,” said then-FHWA Executive Director Frederick G. Wright, Jr., in a transmittal memo announcing the new policy. The core of the FHWA policy, which remains in effect today, are contained in five principles: 1. Recycling and reuse can offer engineering,economic and environmental benefits. 2. Recycled materials should get first consideration in materials selection. AB812 by Assemblymember Fiona Ma, D-San Francico (pictured at left), is introduced into the California Legislature. The title of the bill is “Solid Waste: recycled concrete, recycled asphalt.” Among its provisions, the bill as introduced would require Caltrans to increase the allowable amount of reclaimed asphalt pavement (RAP) used in projects to 50 percent, from the existing level of 15 percent. Lee Gallivan, asphalt pavement engineer with the FHWA, and Gerry Huber, Associate Director of Research, Heritage Environmental Services, a nationally known expert, attend a meeting at the Caltrans Translab offices on the subject of high-RAP. Assembly Speaker Pro Tem Fiona Ma sends a letter to Caltrans Director Malcolm Dougherty saying she was “disappointed” by an earlier letter to her office from Caltrans indicating a lengthy process involved in evaluating a move to higher RAP. Assembly Speaker Pro Tem Fiona Ma, D-San Francisco, speaks at a conference in Monterey put on by the California Construction & Industrial Materials Association (CalCIMA), sponsor of AB812. Oct. 18, 2011 Assembly Speaker Fiona Ma, D-San Francisco, tours a Vulcan Materials facility in Pleasanton, in part to see first-hand how RAP is incorporated in asphalt mixes. Conducting the tour were Vulcan’s Bart Mayoer and Max Pfaff. RAS group has been meeting regularly for many years. Longtime participants have expressed frustration that the current Caltrans specification language with regards to high RAP has, despite industry concerns, become too onerous and expensive, with additional testing requirements, which is a disincentive for contractors to maximize RAP usage. “Industry is very interested in using high percentages of RAP, and 25 percent RAP would be an easy goal to reach,” says Jack Van Kirk, a former Caltrans materials engineer who now works as Director of Asphalt Technology for George Reed Inc./ Basic Resources. Van Kirk is also a longtime co-chair of the Asphalt Task Group. “The problem is, the testing requirements in the specifications are such that it is not cost-effective for the contactor to use anything above 15 percent. Not only is it not economical, there is a concern about the use of solvents and worker safety. The current specifications require a lot of expensive solvent extractions. This is a negative thing that has discouraged contractors from going ahead with anything above 15 percent. So, our hands are really tied on the contractor level because if it’s not going to be economical, you’re not going to utilize anything above 15 percent. That’s where we are today.” The significant use of asphalt rubber mixes in California also creates an impediment to high RAP utilization. A legislative mandate in the 2000s kickstarted the use of recycled rubber in asphalt mixes, largely to find a use for used vehicle tires rather than have them end up in landfills. California is now the largest user of RHMA in the United States. Caltrans specifications currently do not permit RAP in rubber mixes. Oct. 27, 2011 Assembly Speaker Pro Tem Fiona Ma speaks to the CalAPA Fall Asphalt Pavement Conference in Sacramento, highlighting her bill, AB812, on RAP, and said contractors could immediately begin using the specifications on pilot projects. Tony Limas, Granite Construction, delivers a technical presentation on RAP at the CalAPA Fall Asphalt Pavement Conference in Sacramento. Caltrans releases updated specifications for Reclaimed Asphalt Pavements (RAP) and Recycled Asphalt Shingles (RAS). 2012 Caltrans starts pilot project evaluations of Superpave mix designs. Caltrans publishes an updated “Revised Standard Specification (RSS)” that moves toward “binder replacement” language, requiring contractors who use between 15 percent and 25 percent RAP to fractionate their RAP piles and allowing them to “bump down” one grade in their virgin binder if they choose. Jay Behnke, P.E., president, State Testing, LLC, East Dundee, Il., presents on RAP and RAS at the CalAPA Spring Asphalt Pavement Conference in Ontario. Caltrans hosts a one-day workshop on RAP and RAS at a Caltrans facility in Orange, featuring Dr. Randy West, director of the National Center for Asphalt Technology (NCAT) at Auburn Univeristy, and Dr. Richard Willis, lead NCAT researcher, discussing the latest research on the subject. Oct. 24, 2014 Pascal Mascarenhas, Manager, Technical Services, Vulcan Materials, delivers a presentation on RAP at the CalAPA Fall Asphalt Pavement Conference in Sacramento. 1)	lowering the virgin binder grade to allow for higher RAP content; or 2) reducing the RAP percent. Oct. 29, 2014 Gerry Huber, Associate Director of Research, Heritage Environmental Services, delivers a presentation at the CalAPA Fall Asphalt Pavement Conference on the latest research in the use of RAP and RAS. CalAPA member Steve Escobar, president of Asphalt Pavement & Recycling Technologies (APART), Shafter, Calif., delivers a presentation on the effective use of RAP at the CalAPA San Diego Technical Committee meeting. He emphasized the need for good Quality Control/ Quality Assurance programs. Steven Escobar, president, Asphalt Pavement & Recycling Technologies, Shafter, Calif., delivers a presentation at the CalAPA Fall Asphalt Pavement Conference in Sacramento on binder considerations when using RAP and RAS. The National Asphalt Pavement Association (NAPA) publishes “Best Practices for RAP and RAS Management,” No. 129 in its Quality Improvement Series. The report is authored by Randy C. West, Ph.D., P.E., Director, National Center for Asphalt Technnology (NCAT) at Auburn University. The report is sponsored by the U.S. Department of Transportation, Federal Highway Administration. The National Asphalt Pavement Association (NAPA) publishes “High RAP Asphalt Pavements: Japan Practice – Lessons Learned., No. 139 in its Information Series. The report is authored by Randy C. West, Ph.D., P.E., Director, National Center for Asphalt Technnology (NCAT) at Auburn University, and Audrey Copeland, Ph.D., P.E., NAPA Vice President, Engineering, Research & Technology. The report is sponsored by the U.S. Department of Transportation, Federal Highway Administration. April 21, 2016 At the CalAPA Spring Asphalt Pavement Conference, an expert panel discussion on RAP and RAS is held featuring Bob Humer, Senior Engineer, Asphalt Institute, Pascal Mascarenhas, Manager, Technical Services, Vulcan Materials and Edgard Hitti, QC/QA Group Manager, Alon Asphalt. May 23, 2016 CalAPA issues a “Member Alert,” authored by CalAPA Technical Director Dr. Rita B. Leahy, Ph.D., P.E., a White Paper of various technical considerations regarding Reclaimed Asphalt Pavements (RAP) and Recycled Asphalt Shingles (RAS), including updates on AASHTO Standards, test methods, current research and history of recent efforts to increase RAP utilization in California. The report on RAP mandated by AB812 is delivered by Caltrans to the Legislature. 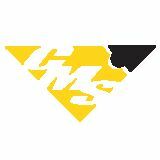 The four-page report says “controlling the performance of high RAP content in HMA requires careful control on how much binder is replaced. This led Caltrans to transition to the basis of the RAP usage limit from aggregate weight to binder replacement.” Oct. 27, 2016 Adam Hand, Ph.D., P.E., Associate professor, Pavement Engineer, University of Nevada, Reno, delivers a technical presentation on RAP and RAS at the CalAPA Fall Asphalt Pavement Conference in Sacramento. Russell W. Snyder, CAE, is Executive Director of the California Asphalt Pavement Association (CalAPA). Brandon Milar, P.E., is Director of Technical Services for CalAPA. This article was reviewed by Rita B. Leahy, Ph.D, P.E., and Ritha Nhorn, Technical Training Coordinator of CalAPA. West, R., Copeland, A. (2015) High RAP Asphalt Pavements: Japan Practice – Lessons Learned, Information Series 139, National Asphalt Pavement Association. U.S. Department of Transportation, Federal Highway Administration, “FHWA Recycled Materials Policy,” Feb. 7, 2002. Accessed via the web on Aug. 24, 2017: https://www.fhwa.dot.gov/ legsregs/directives/policy/ recmatpolicy.htm Burati, J.L. ; Weed, R.M. ; Hughes, C.S. ; Hill, H.S. (2003), Optimal Acceptance Standards for Statistical Construction Specifications, FHWA RD 02-095, Federal Highway Administration Epps, J. (1978) “Synthesis of Highway Practice No. 54, Recycling Materials for Highways” National Cooperative Highway Research Program (NCHRP) MS-2 Asphalt Mix Design Methods (2014), the Asphalt Institute McDaniel, R., Anderson, M., (2000) Recommended Use of Reclaimed Asphalt Pavement in the Superpave Mix Design Method: Technician's Manual, Report No. NCHRP REP 452, National Cooperative Highway Research Program, National Research Council (NCHRP), Washington, D.C. West, R., (2015) Best Practices for RAP and RAS Management, Quality Improvement Series 129, National Asphalt Pavement Association. Above: NAPA President Mike Acott spoke in 2013 at the CalAPA Fall Asphalt Pavement Conference in Sacramento. no special equipment is needed to produce or place Thinlay mixes, a wide number of contractors are available to do Thinlay work. Thinlays can also be designed using polymer-modified binders for improved strength and cracking resistance. High friction aggregates can be used for improved skid resistance. CU: How is constructing a Thinlay different from other asphalt pavements? MA: Because Thinlays are placed in thin layers, there are a few differences from constructing thicker sections. First, they cool more quickly, so it is important to avoid placing them in cold temperatures and to keep rollers close behind to the paver. The MultiCool software and app are a good tool for determining how fast a mix, including a Thinlay mix, will cool under different environmental conditions. Warm-mix asphalt can also be beneficial for Thinlays as it allows mixtures to be compacted at lower temperatures. When placed thinner than 1.5 inches, compaction testing will not be possible. A roller pattern should be established at the start of the job using non-destructive density gages and periodically checked, especially if environmental conditions change. One of the most important steps in placing any type of overlay is the tack coat. Tack should be uniformly applied and allowed to break and set so that construction equipment does not pull up the tack during construction. NAPA has some good guidelines on the placement of tack coats. There is no difference in the paving equipment used to place a Thinlay. Contractors should balance the plant production, trucking, paving speed, and compaction so that the paver moves at a steady pace for the best quality. Again, NAPA has some good guidance on how to balance production rates. CU: How are mix design and quality assurance provided in Thinlay manufacturing and paving? MA: Thinlays use the same quality control procedures and tests used for other asphalt mixtures; for this reason, Thinlays likely have the most rigorous mix design and quality control procedures in place of all preservation treatments. The only difference from other asphalt mixes in quality control is testing for compaction, which cannot be done on layers thinner than 1.5 inches. CU: How can Thinlay reduce the life cycle cost of pavement ownership? staged construction, the pavement is constructed with 8 inches of asphalt and then overlaid with a Thinlay at set intervals to increase the structure before distresses begin. Because the structural increase happens in parallel with the preservation activity, the interruption for drivers can be minimized and agencies can plan for the expense. a pavement to a high level of performance and drivability with minimal construction delay. Knowing the needs of todayâ&#x20AC;&#x2122;s road owners, and the budget stresses they face, I am certain that Thinlays will be used increasingly to preserve and maintain pavement assets and to ensure a smooth ride for drivers in a cost-effective manner. As the industry works to implement performance testing for asphalt mixtures, we expect to see additional innovations for Thinlays that optimize the use of RAP, polymers, crumb rubber, and mix type. Adjusting mixes to optimize rolling resistance, noise, and skid resistance will also occur. To assist in the deployment of Thinlays and the use of best practices, the National Center for Asphalt Technology is developing a Thinlay guidance document, which will be published later this year. CU: Thank you very much Mike for your valued insight. MA: My pleasure. CA Clifford Clifford Ursich is President and Executive Director of Flexible Pavements of Ohio, a non-profit construction trade association. www.scottequip.com Serving California For 50 Years! Trimble portfolio of products. They offer maintenance, repair and field services and, in most cases, they can have a specialist on a job site within 24 hours. SITECH NorCal also has Trimble certified trainers, and offers regularly scheduled classes at their San Leandro facility, including Business Center-HCE, GNSS Base & Rover, Machine Control, and certification for Intelligent Compaction Equipment Training. These trainers are available to teach classes onsite at the customer’s request. Above: Asphalt paver equipped with Trimble® PCS900 3D paving system producing accuracies to 0.01 feet (3 millimeters). 1. SITECH NorCal Field Service technicians can be dispatched to your jobsite to keep your equipment up and running. 2. The Trimble® Control Box/Display Unit is the main hub of the machine control system – it’s user friendly and easy to operate. 3. On-site construction positioning equipment can be used for checking grade, collecting topographic data, and measuring volumes. 4. Intelligent compaction can measure the number of passes, mat temperatures for paving, and stiffness values for subgrade. 5. Trimble® PCS900 Dual GNSS placer spreader control system improves paving productivity, reduces material waste, and reduces labor costs. 6. Trimble® GCS900 Universal Total Station controlled Motor Grader for finish grading to within 0.01 feet (3 millimeters). The day’s biggest winners were Tripp White (left), Blake Isreal and Mike Murray, Vulcan. Steve Cota, Patriot Risk & Russell Snyder, Executive Insurance Services (left) and his Director, CalAPA (left) with Don wife Ruthie both won big. Daley III, CCA/DIII Transport. Chris (left), Rebecca and Olivia Sparks, California Commercial Asphalt. Sarah (left) and Taylor Schmidt, World Oil Corporation. Austin Miller (hat) of World Oil with his daughters. Leanne Szablewski (left), Jackie Allen, Herrmann Equipment, Michelle Roper, Crystal Howard, Enviromine and Kerry Hoover, CMS. The Daley boys at CalAPA’s ‘Day at the Races’ on July 22, 2017. Standing fourth from the left, Jess Libsack from Ramona Paving and Eric Whitford, went down to the winner's circle to congratulate the winner of the CalAPA sponsored race. Brandon Milar (left) and Russell Snyder, CalAPA. Helena (front) and Eric Parker, California Commercial Asphalt. Monique (left) and Frank Vasquez, Frank & Son Paving. Steve (left) and Jennie Betting Attendant (left) and Concannon, Pavement Recycling Brian Hoover of Construction Marketing Services, LLC. Amber (left) and Mike Hinson, Roadtec. Mandy Koehl (left), Linda Caton and Cheyenne Gould, California Commercial Asphalt. Janet (left) and Eric Nielson, Telfer Pavements. Jackie Allen (left), Mike Allen, Herrmann Equipment with Andrea and Walt Weishaar Griffith Co.
Vulcan Materials group; Mike Murray (left), Blake Israel, Tripp White, Jay Carter, Jen Merritt and Ryan Merritt. Sarah Sokol (left) and Devan Hoskins, California Commercial Asphalt. Derek Miller (left), Amber Miller, Melanie Liebl and Jeff Liebl, Quinn Companies. Mike Hinson, Roadtec (left), Race number 6 at CalAPA’s ‘Day Shawn Hutchings, Roadtec, Mike at the Races’ on July 22, 2017. Glenn, ATP Paving, Mike Allen, Herrmann Equipment and Cliff Szablewski, RJ Noble. Sue Liston (front) Larry Liston, and Dana Baltazar, California Commercial Asphalt. Tracy (left), KC and Andrea Zubek, DeSilva Gates. ANNUAL DINNER Thursday, January 18, 2018 Jonathan Club 545 S. Figueroa St., Los Angeles, CA 90071 Meeting dates are subject to change. Watch the weekly Asphalt Insider newsletter for meeting updates or call CalAPA at (866) 498-0761 to confirm meeting date and location.